Melted cheese makes an excellent addition to the standard recipe. To make a BLT grilled cheese sandwich, place a slice of cheese, 3 strips of bacon (you can crumble the bacon if you want), 2 slices of tomato, and another slice of cheese between slices of bread. Add 1 tsp of butter and 1 tablespoon of olive oil to a skillet. Cook the sandwich over medium heat until both sides are golden brown. Instead of making the BLT with iceberg lettuce, try arugula instead! Spread both slices of bread on one side with guacamole. Add arugula, 2 slices of tomato, and 3 slices of bacon. Top with a big slice of avocado. The guacamole offers a nice substitute for mayonnaise and the avocado contrasts nicely with the bacon while still adding a mellow flavor. 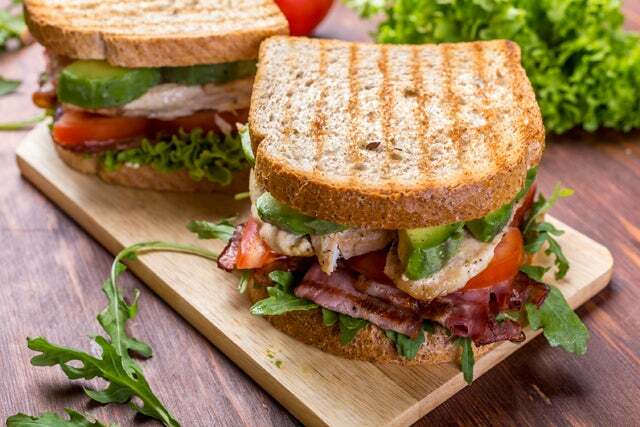 Herbs such as parsley, dill, and watercress add a different flavor to BLTs. The next time you crave this sandwich, make it as you normally would but substitute fresh herbs for the lettuce. You can also keep the lettuce in the sandwich, plus add in some fresh herbs. You don’t need to make a sandwich to enjoy bacon, lettuce, and tomato! As it turns out, this ingredient combination tastes exceptionally delicious as pizza toppings, especially if you use spinach or arugula instead of iceberg lettuce. Simply top your pizza with the usual tomato sauce and cheese and sprinkle about ½ cup of crumbled bacon and a handful of arugula or spinach. Sprinkle a little more cheese on top to prevent the toppings from burning. Bake in an oven that has been preheated to 375 Degrees Fahrenheit until the cheese is golden brown. You can substitute fresh tomato slices for the tomato sauce to give it that classic BLT taste. Bacon, lettuce, and tomato taste delicious on top of a hamburger! Spread mayonnaise on both sides of the hamburger bun. Top with hamburger patty, bacon, tomato, and lettuce. To give this sandwich a kick, use spicy mayonnaise instead of plain mayonnaise. You can make your own spicy mayonnaise by mixing one teaspoon of Tabasco sauce with 1/3 cup of plain mayo. Who says you need to always turn the classic combination of bacon, lettuce, and tomato into a sandwich? These ingredients also taste great in a salad. You can choose any type of salad green that you want but spinach, romaine, iceberg, and arugula all combine well with tomato and bacon. You can also add extra ingredients to your salad such as avocado or even a fried egg!